I am very happy with the purchase. I just can. It stand open litter box or the plastic dome litter boxes. We do not have lots of space to hide litter box, so this little end table- cat outhouse works perfectly in our house. We use it to keep kids backpacks on it. 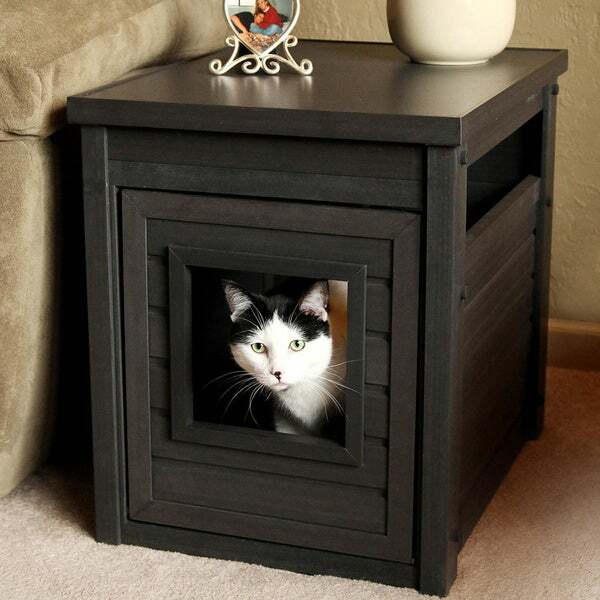 Discretely hide your cat's litter box in plain sight with this litter box end table. Available in a range of rich finishes, the table features clean lines to elevate any decor. The front panel drops down for easy cleaning, while the cut-away entrance provides quick access for your feline friend. Open vents on the sides offer circulation and privacy. I don't have a lot of room but now an unsightly kitty litter box is not sitting out in the open. I put this in a casual living room as an end table, which is next to a glass patio window and in front of another. I then put some clean linen melted wax fragrance on top. It is easy to clean and super easy to assemble. I didn't even get frustrated and usually I panic at the sight of something that requires assembly. Very good item. Highly recommended. My cats enjoy using the litter box and it offers them privacy but they aren't totally enclosed which is good. Very easy to clean as the door drops down. The only problem I've had is my lab and German shepherd have stuck there heads in the opening and opened the door. I just turned it around to face the wall and that took care of it! The table is functional and looks great on all sides! Very nice! We have two cats and one has been diagnosed with kidney problems. We have litter boxes on all levels of our home and like to disguise them if possible as part of the furniture. The material of this enclosed box is excellent. It also has openings on each side, near the top, for your cat to have full view so they don't feel totally enclosed. It is made from a material that will not be ruined if it ever got wet. We have another style that is made from compressed wood and this BAR FAR is a MUCH better quality product. It took only minutes to assemble. Highly recommend this box. My cats actually use this. I think its because of the nice sized opening at the top, they don't feel boxed in. Its easy to clean the litter and it was super easy to put together!!! No tools required!!! Love it! This is one of the greatest purchase I could have made for our cats. I have 2 cats. I've tried different litter boxes and Litter Loo is discrete to hide that ugly litter box. It took a few days for 1 of my cat to get used to it since she doesn't like covered litter boxes. But, its pretty roomy and the opening doesn't have the swinging door so it's easy access. Material is easy to put together and take apart for cleaning. This works great! The enclosure hides the litter box very well and it is easy to open to clean out the box (as opposed to other enclosures that open from the top but have weak hinges). My big 16 pound cat had no problems adjusting to the new situation; I think he likes the top window slats so that he can see out 3 of 4 sides while he's doing his business, I didn't realize that "EcoFLEX" is a type of plastic material that imitates wood. I don't mind it since it won't absorb odors. But because of the faux wooden material effect, I wouldn't use this in a primary room. Nonetheless it works for me and my cat in a side room that doesn't get a lot of foot traffic but enough that I don't want the litter box out on the open. Very easy to assemble. My cats had no problem using it right away and seem to like it. It's really important that the urine isn't absorbed by the 'wood' as my old cat often misses the mark. I really like this table. I have a very small bedroom in a mountain cabin and needed to hide my litter box and also needed a bedside table. It was easy to assemble and looks good. Material is good quality. My cats took to it immediately. Kept the door open for a couple of days just so they knew where the box was. That’s all it took. Love the hidden litter box! I have had this end table for quite a while and it has held up wonderfully. People don’t even notice that it holds a litter box. I did add carbon filters to the open areas on the sides and there are no odors. Very nice appearance, good quality and easy to assemble. Drop down front door for easy access is a bit misleading. I think it would be much easier to clean the litter box if the top hinged open. You have to get down to pull the box out which may not be a problem for some. I use the Tidy Cat Breeze litter box which even though I double checked the dimensions it is an extremely tight fit! I need to pull the box out in order to pull open the bottom drawer to change the pad. I also find the cats are able to drag the pellets out when exiting the loo. I thought the loo would prevent that from happening. Perhaps if the dimensions were slightly larger my average size adult cats would be a bit more comfortable. Better quality than expected. Large enough for 20-lb cat to use. Just be careful that your litter box fits inside (needs low sides to fit). cleaning the inside isn't that difficult, but you have to keep up with it or it will start to smell. Other than that, good quality and enough room for my 14 lb cat. Not so easy to assemble...had to call tech support. Once in use, the male kitty stood up to urinate...this urine reacted very intensely with the material that the box is made of thus causing a chemical reaction with a horrible odor that permeated throughout the house and infiltrated the cooling system. I had to throw the box away because the odor was permanent. I really liked the way it looked. What an expensive waste of the cat's allowance. This item is overpriced for what it is. It looks really cheap and you have to take it apart every time you need to clean the litter box. Plus, once it smells like urine, it is impossible to get the smell out. I threw it away. It is a good product if you have a smaller cat or you are ok with having to clean often. I had hoped it was bigger. We just use it as a feeding station. This was purchased, obviously, to hide the litter box. We are not using this as an end table and removed the front panel because the kitty objected to using the "door". Its been perfect ~ the construction is strong and sturdy. Especially like that "accidents" won't penetrate. I've gotten so many compliments on this. You can't tell I have a litter box. I use the top of this as a place for her to sleep. She's like a like queen. I love this. It is a nice way to have the cat box in the office without dealing with the mess. It was easy to put together, looks really nice, and doesn't take up much room. I like that the material it's made of is waterproof so we only need to wipe it clean. I also put painter's tape across all the seams inside the box so no cat sand will have an opportunity to get lodged inside the seams. VERY HAPPY with this purchase! "can 2 cats used this box, can and automatic litter box fir inside"
There isn’t a set number of cats this item is for. The standard Litter Loo (ehlb801) houses one litter box, but cannot accommodate the automatic box. The Jumbo Litter Loo (ehlb802) can accommodate some automatic litter boxes. "Will a fat 20lb cat fit in the entry door?" "Please confirm that the door cutout on this unit is 16.5 inches Long x 14 inches Wide? I have a large cat, and the "Jumbo" unit says it is only 7.9" x 7.9" opening." "Are there any models where the door opens to the side instead of the front?" We do not currently offer a similar item that opens from the side. "Is it possible to install this without attaching the drop down door?" Hello flshoppergirl, different pieces attach via 12 large screws. You should have no issue leaving the door out of installation. Thanks for shopping with us! "Do you know if the Breeze littler box will fit within this?" Hello twild28, the interior dimensions are approximately 15.5 inches wide x 21 inches long. We recommend checking the dimensions of the litter box you wish to use with this item. Thanks for shopping with us! We have a cat who has been diagnosed with kidney failure. it is best to have several litter boxes in your home if you have a cat with this condition. I do not want open litter boxes...these types work nicely to blend with furniture and help him with his condition. Need a hidden litter box that looks attractive in an open area of the house.